Parker 45 fountain pen, made after 1970. AC date code signifies 1982. Cartridge/converter filler in steel black with a brushed steel cap and chrome trim. FINE steel nib. Excellent condition. Type Cartridge/converter filling fountain pen, working well. Product Name Parker 45 Classic, Classic refers to the cap material. Filling System Fountain pen takes Parker cartridges, or converters. A slide converter is installed. Color Steel black body with flighter (brushed steel) cap, chome trim, an arrow clip, and a dimpled cap tassie. Nib FINE steel nib. 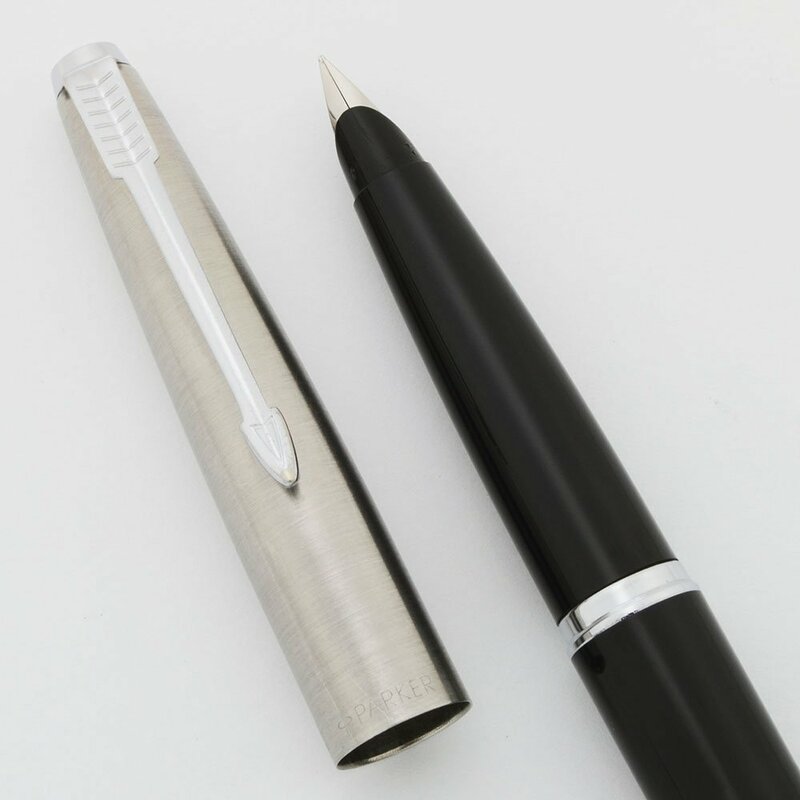 It writes smoothly and has a large amount of tipping material. The nib collar is marked "F" . Condition Excellent condition. The pen looks shiny and attractive and the color is uniform. The section and barrel have light scratching. There is a cluster of small scratches about a quarter of the way down the barrel from the trim ring. The cap is in excellent condition with just some light scratch marks. The clip is nice and shiny. The feed has some small deep scratches (resembling tool marks). No cracks, dents, chips, dings, or personalization. The imprint is clear.